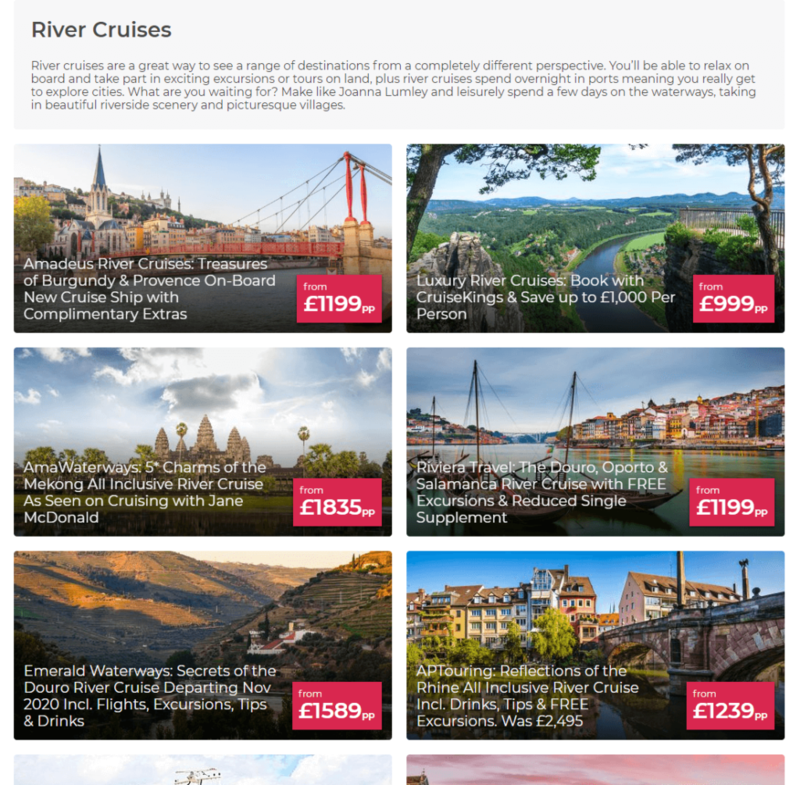 icelolly.com is set to bolster its cruise programme with the launch of a new Deals Collection specifically designed for customers seeking inspiration, new ideas and, above all, the best value deals in the River Cruise market. Featuring alongside the company’s comprehensive Ocean Cruise offering, the all-new Collection has been created in response to customer feedback and will capitalise on growing momentum in the sector by highlighting the different types of Cruise experiences available, with inspiring and exciting itineraries for new-to-cruise and repeat cruise customers alike. Deals featured in the new, stand-alone River Cruise Collection will include a comprehensive selection of itineraries from some of the UK’s leading River Cruise operators including Avalon Waterways, Viking Cruises, Uniworld, APT Touring and Emerald Waterways. Following significant investment in icelolly’s media and branded content solutions for travel advertisers in 2018, the re-launch marks the next phase of the company’s focus on building its cruise presence. Royal Caribbean, Princess Cruises and P&O Cruises are just some of the cruise companies to have benefited from bespoke, high-profile campaigns which fully leveraged the metasearch, deals and media platform’s consumer and trade touch-points. From dedicated deals and itineraries to value-added content in search results, homepage takeovers and microsites, targeted promotional activities across social, on site, email and other owned media channels were designed for each cruise partner to maximise brand awareness, drive new customers and inform broader audiences of their products. icelolly’s focus on cruise follows the launch of a significant 15 month partnership deal with the ITV Family throughout 2019 and into early 2020, which includes the sponsorship of afternoons on ITV3, whose core viewership of parents with children and the post-family audience closely match the cruise customer demographic. In addition, the all-new Do It For The Stories – We’ll Find The Deal To Get You There advertising spot features a dedicated cruise segment, which further highlights icelolly’s comprehensive cruise offering. icelolly.com compares more holiday deals than any other website in the UK. With more than 20 million visitors each year and one of the largest Social followings in travel, icelolly.com allows customers to compare and save on millions of package holidays, cruises, UK breaks and more from leading travel companies. Named the UK’s fastest growing holiday comparison website according to Hitwise, icelolly.com’s growing stature as one of the UK’s leading travel brands was recognised by customers and the industry alike in 2018 – a trend which has continued into 2019. The company was named ‘Rising Brand of the Year 2018’ at the Travolution Awards, also winning for ‘Best Use of Social Media’; ‘Travel & Tourism eCommerce Website of the Year 2018’ at the Northern eCommerce Awards; and won the award for ‘Innovation in Integration: Combining Tech Powers’ at the 2018 dotmailer Email Marketing Awards: the dotties. On January 30 2019, it was named ‘Best Website’ at the Northern Digital Awards 2019.